CHURCHILL BRAMBLE FAYRE. A gravy boat & stand. Harvest design. Lovely condition, tiny blue dot on gravy boat, see pic. CHURCHILL BRAMBLE FAYRE. A lovely tea pot. Harvest design. Impressed backstamped. Excellent condition. 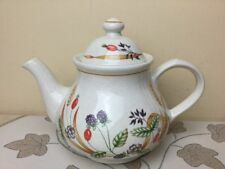 Churchill Bramble Fayre large tea pot. Superb condition. CHURCHILL BRAMBLE FAYRE. A pretty set of 3 mugs. Excellent condition. Churchill Staffordshire pottery milk jug and sugar bowl in the Bramble Fayre pattern. Very good condition, no issues at all. Lovely biscuit barrel in the Bramble Fayre design by Churchill - great used condition just a couple of tiny scratches on the lid ( see photo ).